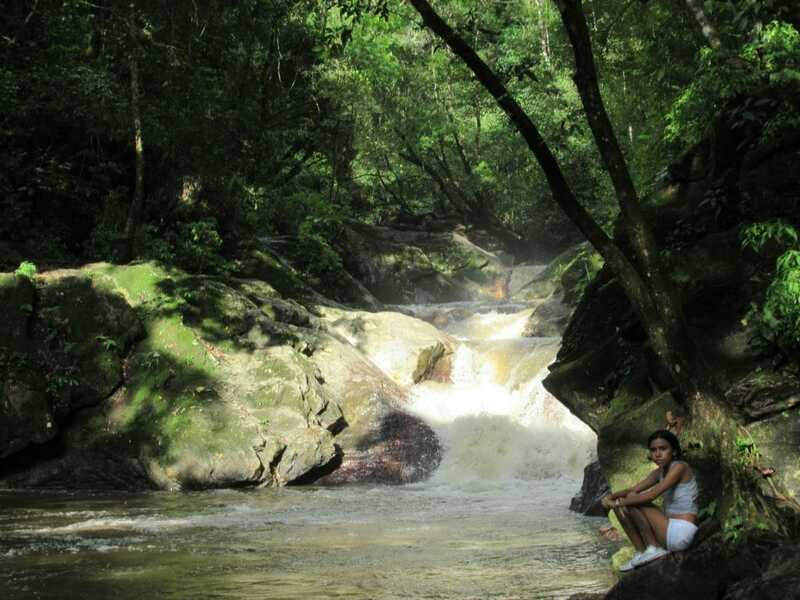 Minca is a small town in the mountains above Santa Marta and has become a popular eco-tourism destination. Sporting picturesque scenery with a lush forest, stunning views of the surrounding mountains and several waterfalls, Minca is well worth a stop during a visit to Colombia’s Caribbean coast. Read on for a complete travel guide to Minca, Colombia, including why you should visit, how to get there, accommodations, and what to do when you visit. 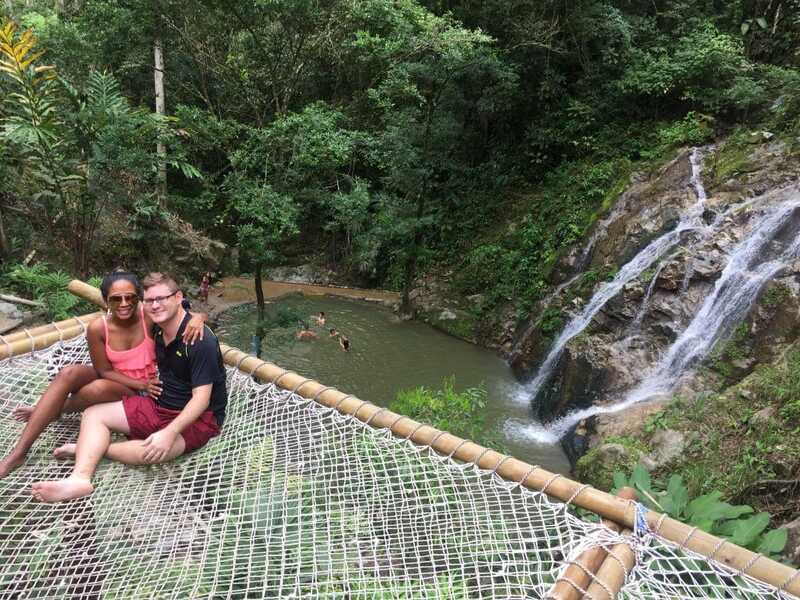 Chilling on a giant hammock overlooking a waterfall! What more could you ask for? Waterfalls, hiking, birdwatching, great cafes, local coffee, even a local brewery, this little town has it all. Minca sits about 650 km above sea level, nestled in the forest of the Sierra Nevada mountain range just above Santa Marta. I first visited Minca during my first year in Colombia in 2011. I just went up for a day and explored while staying in Santa Marta. My wife and I returned to visit in May 2018, and the tourist scene has grown quite a bit, but is not overrun and still feels like a quiet little town in the mountains. Minca has become a big eco-tourism destination, and there has been a proliferation of small hostels and eco-hotels around the town offering easy access to the surrounding nature. There are also some good little restaurants that have opened up in town catering to the tourist crowd, but at reasonable prices. If you’re looking to see some pretty waterfalls, do some hiking, or just relax in the peace and quiet of nature, you should consider spending some time in Minca. 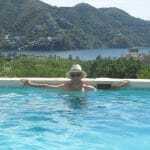 It makes for a great chilled-out break from partying in Cartagena or roughing it in Tayrona or on the Lost City Trek. Not to mention, you will also get a break from the sweltering heat in the fresh, and slightly cooler, mountain air. Honestly, Minca is probably a nicer jumping off spot to Tayrona, the Lost City, Palomino, or the other nearby beaches and attractions than Santa Marta itself. So, if you were planning to spend a few nights in Santa Marta, consider opting for Minca instead. If you do decide to go, read on. In this travel guide to Minca, you will learn why you should visit, how to get there, available accommodations, and what do do while there. 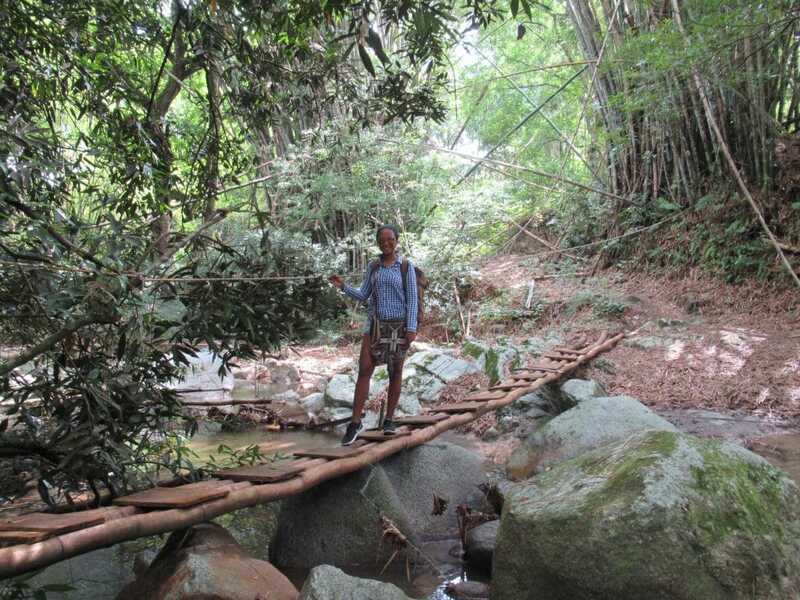 Pretending to be Indiana Jones and hiking over footbridges like this is one of the many things to do in Minca. You will need to get to Santa Marta first. You can travel between Cartagena and Santa Marta on buses from the main bus terminal, Berlinas, or Marsol. (Note: these prices were last updated in January 2019). Buses from the Terminal-Prices for buses to Santa Marta at the terminal may vary depending on company and time but should be between 30,000-40,000. Do note that the terminal is far away from the main tourist areas of Cartagena and is a costly taxi ride. You can check times and buy tickets online at redbus.co. Berlinas-Berlinas operates vans and buses and transportation from Cartagena to Santa Marta. Their office is located in Marbella, about a 25 minute walk or 5 minute, 7,000 peso taxi ride from Centro. This is my recommended way of travel. They have buses leaving every 40 minutes beginning at 4:40 am (6 on Sundays and holidays) until 6 pm for 44,000 pesos. Marsol-Marsol operates vans like Berlinas but offers an optional pick up service (for an extra surcharge). Their office is in Cabrero, about a 10-15 minute walk from Centro. We used to always use Marsol, but lately we’ve been more impressed with Berlinas customer service. Marsol charges 42,000 pesos. The surcharge for the pickup service is 10,000 pesos extra. That’s the less or equal to what you’ll spend on a taxi from anywhere in the tourist zone and you’ll save time as they will pick you up much earlier. In all, I don’t think the pickup service is worth it. No matter which option you choose, the trip should take approximately 4-4 1/2 hours. Usually, you will stop to drop and pick up more passengers in Barranquilla. From Barranquilla, you can also get buses to Santa Marta from the bus terminal, with Berlinas or with Marsol. Travel time should be about 2 hours. From Palomino, you can catch buses for 10,000 pesos on the road out of town. It is possible to fly into Santa Marta from other cities in Colombia as well. Check out flights on Colombia’s flagship airline Avianca. The cheapest option is to catch colectivos from the market in Santa Marta. I’ve seen prices from 6-8,000 pesos listed online. It used to be you could catch them as well from the gas station in Mamatoco, near Dreamer Hostel, but that is no longer the case, as we learned the hard way when we could only find normal private taxis and moto taxis there. There are a ton of options for places to stay in Minca, ranging from hostels, small hotels in town, or eco-hotels in the surrounding area. During our last visit, we stayed at Minca Glamping. The property is fairly new, just opening in early 2018 and run by a lovely couple. About 20 minutes outside of town, it’s aptly named as you feel like you are really in the forest, but you can still get to town easily. There are only 2 small, lovely cabins, each sporting a little porch with a hammock, running water, and even a coffee maker. While we were on the go during most of the two days we stayed, it was super relaxing in the evening, and we saw lots of birds and butterflies. Our lovely cabin at Minca Glamping, a great place to stay in Minca. The included breakfast was also great with a big bowl of fresh fruit, and choice of eggs and toast, pancakes, or cereal and yogurt. We had dinner both nights as well, which was also delicious. The only real downside is with having to hike back, we didn’t really want to stay out long after dark. Overall, Minca Glamping is an awesome choice to spend a few (or more) relaxing nights in the peace and quiet of nature. You can make your own reservation for Minca Glamping at booking.com or hotelscombined.com. If you’re looking to be even farther away from civilization, then head high up in the mountains to hostel Casa Elemento. It is about a 3 hour hike or half hour moto-taxi ride from town. Casa Elemento is famed for its giant hammocks. We didn’t stay there, but took moto-taxis up to check it out. It’s an impressive place, sporting a bar, pool tables, a restaurant, and, of course, the giant hammocks. The day we went it was pretty overcast, but I imagine with clear skies, the views of the mountains are stunning. 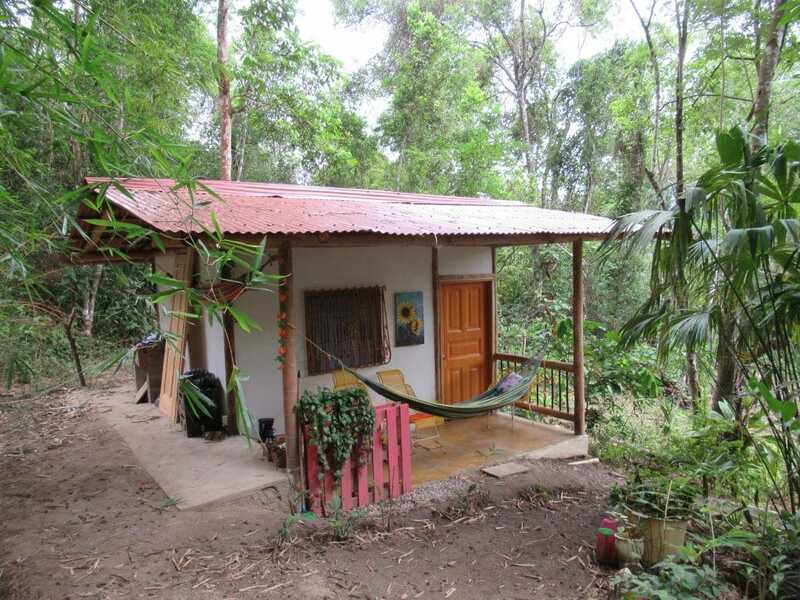 Sporting a hipster-hippy-backpacker vibe, Casa Elemento is a great option if you’re planning to stay for 3 or more nights and are going with friends or looking to meet fellow travelers. However, if you’re only able to stay for a night or two, I’d say you’d be better off closer to town where it will be easier to see all the surrounding sites. Let’s be honest, you’re going to end up spending at least one half day chilling out on the hammocks just enjoying the view or getting over your hangover from drinking with the fellow travelers you met. For that reason, I’d only recommend Casa Elemento if you have several nights to stay in Minca. You can make your own reservation at Casa Elemento at booking.com. Susana enjoying one of the giant hammocks, one of the allures of a visit or stay at Casa Elemento. Perhaps the best of both worlds is Casa Loma Hostel. Located on the top of a hill above the center of town, it offers an incredible view overlooking the mountains and forest with Santa Marta and the Caribbean sea in the distance. I haven’t stayed there, but did hike up there and had a coffee the first time I visited Minca and the people I know who have stayed there have had great things to say about it. The view really is spectacular and though its a bit of a hike up, you’re practically in the middle of town, just up on a hill. That means you can still enjoy dinner or a few drinks at one of the cafes without feeling like you have to trek far away. You can make your own reservation at Casa Loma at booking.com or hotelscombined.com. There are tons of other options in and around Minca for just about any price range, so check out other options as well before you go. See more places to stay in Minca at booking.com, expedia.com, and hotels.com. There are a number of nice little restaurants and cafes in town, including several of which offer good vegetarian options. If you’ve been traveling in Colombia for a while, Minca is also a great place to get some more international inspired fare or a good steak at much more reasonable prices than you’ll find in Cartagena. Our favorite place to eat in Minca was the Lazy Cat. We both got burgers for lunch one day, and enjoyed a great quesadilla as a late afternoon snack the next. They also had a great looking Wok option that can be ordered with your choice of meat or vegetarian. With 2 for 1 cocktails during a late afternoon to early evening happy hour and a little deck outback, its a nice place to grab a drink as well. Lazy Cat also has the locally brewed craft beers from Cervecería Nevada on tap. I recommend the Happy Tucan, a red ale or Happy Coca, a pale ale brewed with coca leaves, although the Happy Nebbi, a Pilsner, is a good option if you’re looking for something lighter. If not on tap, most places in Minca should have them bottled, and you should definitely do yourself the favor of taking a break from Aguila and Club Colombia and enjoying one….or four. We wanted to check out Casa Cristi, which is really more like 3 restaurants in one, sporting vegetarian, burger, and grilled fare. Unfortunately, we missed lunch time our second day. We did enjoy some great coffee cake at El Bistro at La Victoria, while waiting to do the coffee tour. Their sandwiches also looked delicious, but they had run out by the late afternoon when we were there. Santisabella has rave reviews for their Italian food, and friends recommended Casa Antonio for their steaks. Needless to say, there’s no shortage of good options for dining in Minca. The main attraction in Minca is the gorgeous natural surroundings. Still, for such a small town, there is a lot to see and do. Below is a run down of some of the best things to do in Minca. The falls at Marinka were by far the highlight of our visit, and are one of the must do activities in Minca. Sporting two falls and a small little watering hole, we found it much more impressive than Pozo Azul. You can get to the Marinka Waterfall by following the main road to the right from the bridge at the center of town. The hike there is mostly pleasant along the little road out of town, with a bit of an incline towards the end and should take about 90 minutes depending on your pace. You’ll also have the opportunity to see some birds and butterflies, although do watch out for motos and trucks coming around the bends on the road. You could also opt to take a moto-taxi from town if you’re pressed for time. The Marinka Waterfall is one of the many examples of the beautiful natural scenery and one of the can’t miss things to do in Minca. Once there, there is a small entrance fee (I want to say it was 5,000 pesos each). However, it is worth it as the owners have put in the time to make it a nice place to visit. There’s a little cafe on site as well as bathrooms. 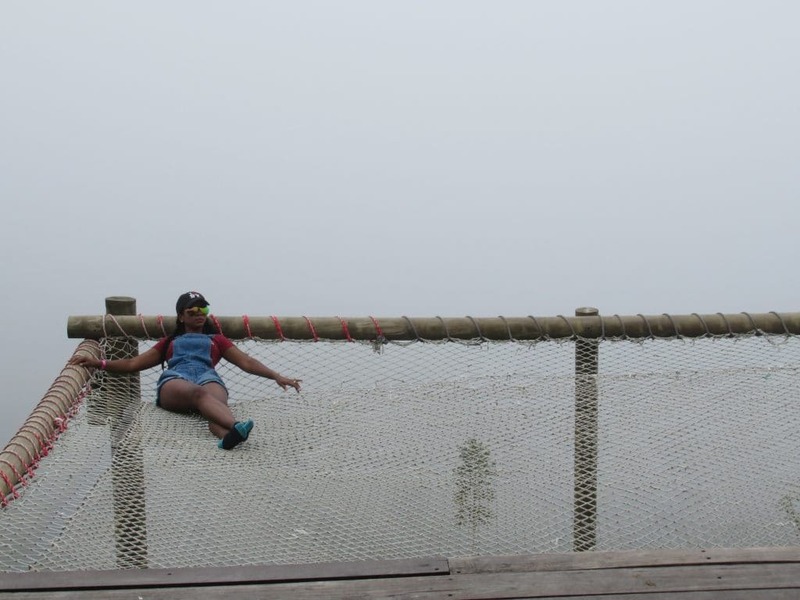 Also, they have some of the big hammocks overlooking the falls, a great spot for a picture. Be sure to hike up to the upper falls as well, as they are a bit taller. Although the water isn’t deep enough to swim here, you can still stand under the falls and get a refreshing blast of icy cold water or be like Susana and do some supermodel poses for photos. After seeing them, head down to the lower falls, where the water is about waist deep and you can go for a little swim. I’d recommend heading to Marinka early in the day to beat the crowds and not feel rushed given the hike back to town. We went in the morning and then stopped in town for lunch before going to Pozo Azul in the afternoon. Pozo Azul is another, smaller falls and watering hole just outside of Minca. It’s about a 45 minute walk heading straight up the road from the bridge in the center of town. Again, you can also take moto-taxis. There’s no entrance fee for Pozo Azul. The falls at Pozo Azul, another one of the popular things to do in Minca. The “blue well” was not that blue when we went as it had been raining a lot. In fact, shortly after we got there, the water rose quickly as it was raining father up the mountain. If you are short on time and can only do one of the falls, do Marinka, as it was more impressive. However, if you have the time Pozo Azul is still worth seeing and spending some time splashing around. And hopefully you have better luck than us and don’t have to hightail it out of there a few minutes after arriving. I highly recommend making a visit to La Victoria. They still use machinery imported into Colombia in the early 1900s. Even more impressive is the whole process uses water, not only to hydraulically power the machinery, but to move the coffee beans from one step in the process to the next. We were there during the offseason, but our tour guide still walked us through each step of the process, explaining how the machinery works. I imagine it would be a real treat to be there during the harvest and actually see it all in action. I’ve done several coffee tours during my time in Colombia, so I had a handle on the plant to cup process, but I still learned a lot during the tour. In particular, I learned more about how the industry works and the different grades of quality of coffee. Of course, the highest quality beans are reserved for export, but they do keep some on hand that you can buy at the end of the tour and take home to enjoy later. Wonder besides waterfalls, what to do in Minca? 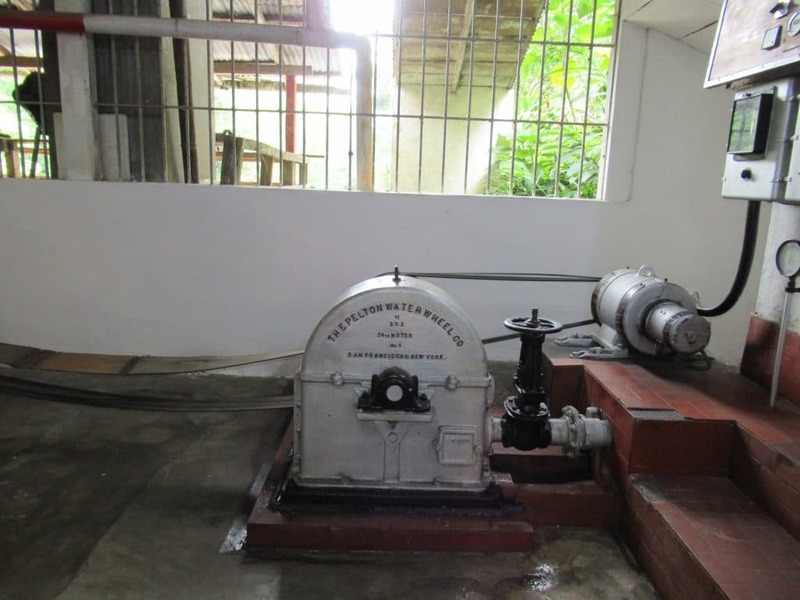 See the 100 year old machinery still in use today at La Victoria, one of the coolest things to do in Minca. The tour takes about 45 minutes, and you get a cup of coffee before and after. Even if like me, you’ve done the coffee plantation tour before, it’s still worth it to see the machinery and gleam some nuggets of extra wisdom. The craft brewery Cervecería Nevada is also on-site, and while they weren’t offering tours of the brewery while we were there, you could sample the beers. After Marinka, La Victoria is in my opinion the other must do activity in Minca, especially if you’re a coffee and beer lover like me! As mentioned above, we didn’t stay at Casa Elemento but wanted to check it out. It is about a 3 hour hike, but we arranged for a couple moto-taxis to take us up and wait for us before taking us on the La Victoria with a stop at Los Pinos, a lookout higher up in the mountains. It cost 10,000 pesos for a day pass to enter and includes a beer or other drink. We spent an hour or so exploring the property and chilling out on the giant hammocks while enjoying the view. It was a neat place to check out even if, like us, you don’t want to stay there. If you’re willing to get up very early and can fit it into your schedule, there are bird watching tours in Minca. We didn’t do one since we didn’t have the time over our two days. However, everyone I’ve talked to who has done it has said it was worth it. If you’re pressed for time and want to fit in as much as possible, you can do moto-taxis to just about all of the things to do in Minca. 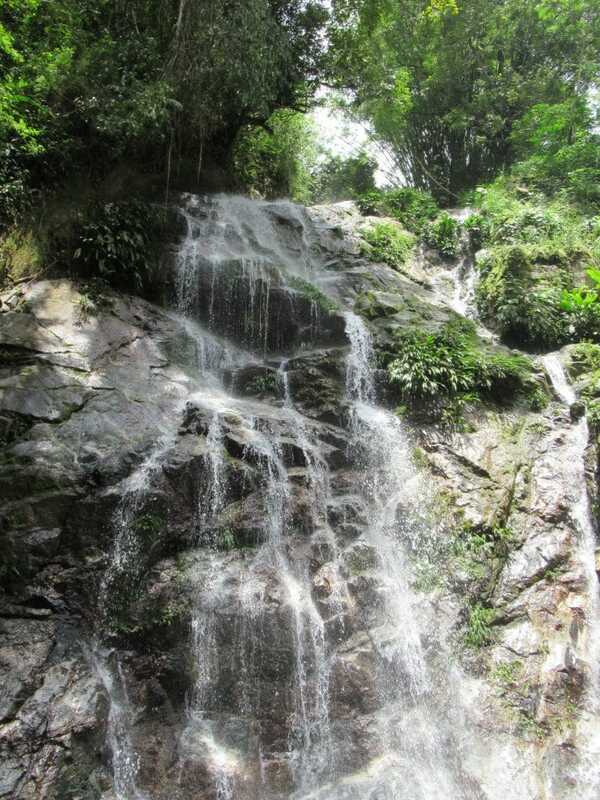 However, you came to Minca to enjoy the fresh mountain air, so make a point to at least hike to one of the activities. It’s well worth it to enjoy the natural surroundings. 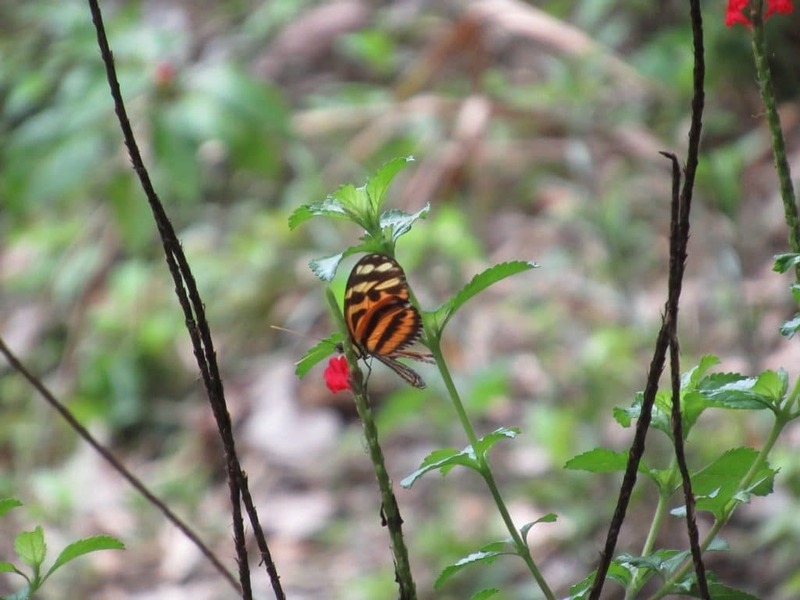 And don’t forget to be on the lookout for butterflies and toucans! Be sure to take in the nature around you when you visit Minca! There’s no ATM in Minca, although there was a place that would do cash-back for a fee if you’re desperate. However, you’re better off hitting an ATM in Cartagena or Santa Marta. Some of the restaurants in town may accept cards, but you should definitely bring cash. Bring a bathing suit, you don’t want to be that person who has to look on while everyone else enjoys the waterfalls. Bring insect repellant. Particularly at night, there are lots of mosquitos. I recommend Off! Deep Woods available on Amazon or the Stay Off! Amazonic brand that is sold in supermarkets here in Colombia. If you’re staying out of the center of town, bring a good flashlight just in case you are out after dusk. I recommend this durable Mini-Maglite available on Amazon, perfect for travel. There you have it, a complete guide to a visit to beautiful Minca, Colombia. You should absolutely try to fit in a visit there if you’re traveling through Colombia’s Caribbean coast. If you do decide to go, I hope you find this guide useful in planning your trip. I’d also love to hear about your trip in the comments below! Interested in learning more about destinations on Colombia’s Caribbean coast? Check out our guide to Palomino, a relaxed beach town about an hour and a half north of Minca and Santa Marta. Check out our guide to Tayrona National Park, located about an hour from Minca and a great place to enjoy hiking, camping, and beaching it. Check out our guide to Taganga, a beach town just outside of Santa Marta and visitable in a day trip from Minca.